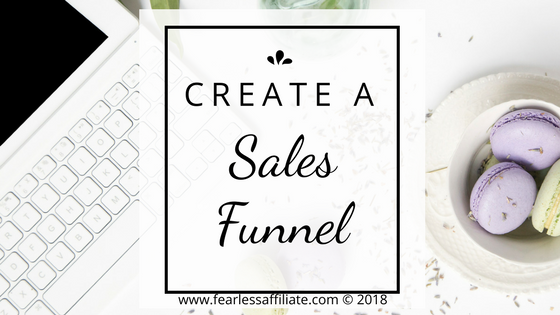 If you want to monetize your blog or website, the most stable way is to create a sales funnel. Affiliate programs may come and go, but your email list of loyal subscribers will stay with you forever! 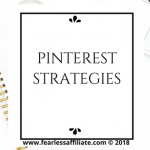 Recently I discovered a whole underground movement devoted to Pinterest marketing. And my outlook has changed. There are a lot of successful bloggers out there creating their own stuff to sell visitors. Most of them are following a basic marketing principle: A sales funnel with effective email marketing in place. Some people are still offering up crappy free stuff, but a lot people are offering up legitimate value within their free stuff. This also has the side benefit of causing you to prioritize your money-making projects first. Because seriously, most of us are trying to earn a living with our websites, am I right? As well, when you change your focus to one where you offer a lot of value that will bring you some loyal subscribers, you also work harder on giving your visitor awesome value in all of the free content, because you want to set yourself apart from the people giving away crap. Notice number 3? This is the key area. At this point in your sales funnel you need something really compelling to promote to your visitors…something to get them on your list. Because if they do not sign up for something, there is no reason for them to stay and enjoy all of your awesome content is there? But let’s not get too far ahead. We shall start at the top and work our way down until we have sorted all of this out. This can be anything…a recipe…how to clean your headlights…how to trim your dog’s toenails. They are searching. Someone is seeking a solution to a problem. You have a solution for this person, so it is only a matter of making a connection between you and them. You write an awesome blog post offering a perfect solution and then put your links in social media. And people find you and come to your website and this is AWESOME! 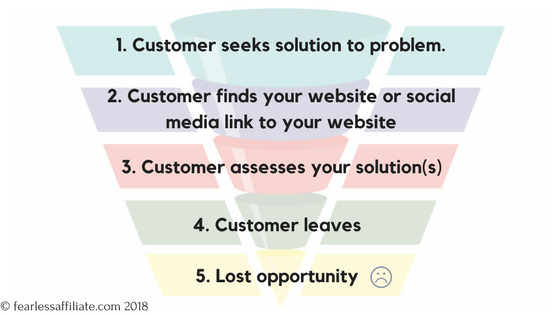 So we can see that the problem happens at point number 3, when the customer assesses your solution. It may be an awesome solution but it is not keeping them at your site and it is not encouraging them to come back for more. This is the point where you NEED an email system in place. Not a “sign up for my newsletter” random box in some obscure spot on your blog. Everyone has a newsletter, so that is not really compelling. And not a basic opt-in plugin because it does not give you the tools that you need to make a solid connection with your visitors. No, your opt-in box requires priority placement and a way to send newsletters (not RSS feed, but a letter that you write)! Sign up for MailerLite if you need an Email Service Provider (ESP). 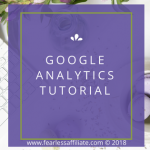 They are free for the first 1000 subscribers and you can create tons of opt-in boxes for your website that you can customize with your brand colors. If your “About Me” blurb is at the top of your sidebar then put your opt-in box right ABOVE IT. When they sign up for your freebie (aka Lead Magnet) you can introduce yourself in your first email. If you have a theme that allows it, use an opt-in form as your header. 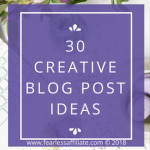 Write a blog post about your freebie. A whole post on what the problem is and then an opt-in to the solution. DO NOT GIVE AWAY THE SOLUTION IN YOUR POST! This is the key to getting them to sign up. Just hints. And no, you do not have to do this for all of your posts. Maybe once a month or every six weeks or so. Coupons, Discount codes, and Special offers – Incentive to buy from you in the future! Giveaways or sweepstakes – a great way to get a bunch of signups is a contest that you can promote on social media. They have to sign up for your newsletter to get their name in the draw (check your local laws for how to set up this type of giveaway so that you are not doing anything illegal!). The prize can be an ebook that you have written or a personal consultation for 30 minutes. Checklist, Worksheet, Free Report, PDF, Infographic – These are simple to create in Canva, which already has tons of free templates. Just swap out your brand colors and pertinent information. Create a mock-up or screen shot the freebie and put in your blog post! 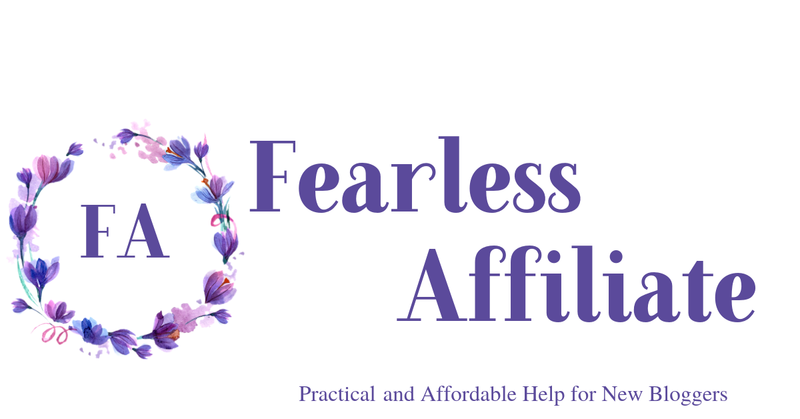 Free: Consult, shipping, upgrade, personal call (Value of $), strategy session – these are great for people who need to connect to a real person so that they can ask questions or gain clarity. You do not have to spend too much time on the freebie. Some of them work and some don’t. You will have to try different wording, pictures and incentives to see what resonates with your audience. Use Free Canva to create as many of these as you want and test them all. I have a blog post on how to use the most common functions of Canva here. You can also promote a free course that you offer only through sign up. This does not have to be complicated. I have signed up for some really decent content that was basic text-only daily emails with no pictures or media of any kind, but it was totally awesome and very helpful. Later on, you can package the units into an ebook! 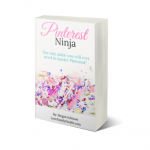 Pinterest Tip: Make a pin with a thumbnail of your freebie and put that on your pin. Be sure to use large easy-to-read fonts and emphasize the word FREE (call to action). Make sure that your website URL is on your pin as well. Then link it to the blog post. Part way down your blog post you put the box with the freebie opt-in. Monitor the results. Your freebie needs to encourage the people who see your social media posts to feel compelled to click on over to your website and check it out. This creates the link from #2 in the funnel to #3. Once you have people on your email subscriber list, you want to nurture that relationship. 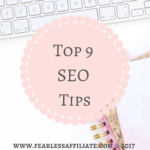 You send them great tips, links to blog posts (don’t assume they have read all your stuff already! 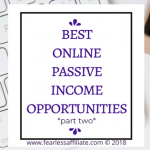 ), helpful information from other bloggers in your niche, and strategies that they can use to help themselves. If your free stuff is crap, they unsubscribe. But if they are still around at this point THEY ARE YOURS! You can now sell to them and have a better chance that they will buy. 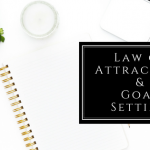 In the early stages, during your welcome series of emails, you can promote something low-cost and not offend too many people with a sales pitch. If you are doing 4 or 5 emails in a welcome series, you can promote your item in the last or second last email, after you have introduced yourself and explained how you can help the person. If you have series of posts that you can re-package into an ebook, you can sell that for cheap (no more than $7). If someone buys that, then you will likely be able to sell them something more expensive later. 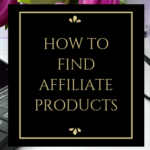 This is also when you can promote a series of affiliate products that go together. Just make sure that the price is very affordable so you do not scare people away, or that they are getting a nice trial period before they have to pay a larger price. Instead, you want to give a little bit more of what you have to offer for a small amount of money. You are kind of testing the waters with your subscribers to see what interests them and who wants to buy. This also gets them used to purchasing from you. This reminds me of when a tail light went out on my car and I could only find one YouTube video on how to fix it, and wow it looked complicated. I bought the tool that I needed but when I started the project I gave up because it was clearly going to be a pain in the neck, and I did not want to be hanging off the back end of my car in 35C (95F!) trying to figure it out. A few weeks later, I went to one of those quickie oil change places. The guy there offered to fix my tail light for 5 bucks. I jumped on that! The point with my story is that people are at various stages of research and may encounter your website at any point. I was very willing to pay 5 bucks for someone to fix my problem for me. And if your people are in the stage of your relationship where they are starting to trust you, they will not mind paying $7 for a solution, because even if it is no good, it is still not much of a financial loss, so it is easier to swallow that price. And if you surprise them by giving them super awesome value for that $7 you will now have a very loyal repeat customer. And the best part is that if people do purchase these products, then it is likely that there will always be a market for it. And that means you create it once but sell it forever. Steady income! I was trying to impart that when I wrote the post on Pinterest Ninja. I feel that I got a superior value for the money that I spent, because that information helped me immensely. I am now a loyal customer! I hope that I have inspired you in some way to start an email campaign and create the integral part of a sales funnel. 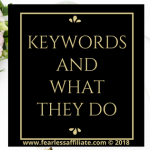 You hear tales told of 6 figure bloggers who all say that they regret waiting to set up email marketing, and who knows how much money they left on the table because they did not take the time to “get ‘er done”. – 4 or 5 emails for your welcome series, where you introduce yourself and how you can help, as well as useful and pertinent information to keep them from unsubscribing. Then weekly updates or whatever you want to offer. You want to keep your subscribers engaged so the stick around. You can go with RSS feed until you set up a schedule for sending out your weekly newsletter. I would advise not waiting too long or you lose customers who are not interested in the weekly blog post, but are looking for something more personal. If you need ideas, sign up for a few newsletters and see what resonates for you and duplicate it in your own way. An effective email system is hub of successful affiliate marketing and a sales funnel that will bring some cash for your hard work. And creating your own stuff to sell guarantees that your product is always available. 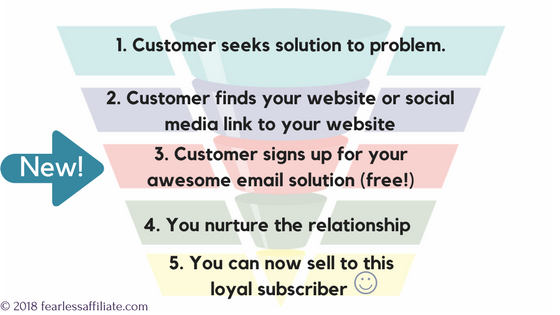 Then you just have to keep working on step 2 in the funnel because everything else is done. A quick look around similar niches will show that the more and more successful marketers are selling their own products. Even a $19 ebook can generate decent income and if you can repeat that, as I have seen many people do, you will be creating a scalable income where the sky is the limit! Comprehensive post. I like the ethical take. Going to follow you and subscribe. Thank you Verla and thanks for visiting us today! I need to create a sale funnel but I feel as if my website is not mean’t for these kind of sales, maybe if I create another website I can give it a go. I agree with everything that you’re saying though! building trust is the number 1 solution to creating any good business relationship with your consumers! Hello Jeremy and great to see you here again! I hope that you can find some kind of incentive for people to sign up to a newsletter; it really is a great way to connect with visitors. Maybe you could offer a fun t-shirt as a giveaway prize? Or some other inexpensive gaming-type item? This is some great information Irma and one I have been thinking a lot about lately. I have several things I can offer my website visitors but I just haven’t decided on what it is going to be. I also have yet to get my CTA in place, another thing I am working on. I definitely am going to check out MailerLite. I need to research and see what are the benefits over MailChimp. But either way, this is information I needed to read because it has created some inspiration in my approach to this issue I have been debating. Time to get to work on this. Thank you. Hi Robert and thank you for visiting today! Yes, I regret not working more on what I had set up last summer with MailChimp, but it could not be helped. It is just another awesome way to connect with our audience! I recently (like 3 days ago) turned on the “sign up” feature on my website, haven’t actively started using it yet. My initial thoughts were simply to notify users of a new post, but you have given me some additional things to consider to leverage this also. Oh that is awesome and thank you for visiting us today. Let me know if you need any assistance! Hi Irma, This wonderful information has given me a whole lot to think about. Am trying to work out what sort of give-away things I could use as my site is all about sewing and crafts. Will have to put on my thinking cap. Also living in Africa posting things is a bit of an issue. Hope something clicks in my addled brain and I come up with a solution. Hi Jill and thank you for visiting today! You are in the craft niche and there are tons of things that you can giveaway. You can do an 5- day organize your sewing room course, or how to get started (things you need to sew your first skirt or top or something), or how to alter different types of clothing. I would suggest that you go to Pinterest and search your niche and look at pins to see who is giving away something. 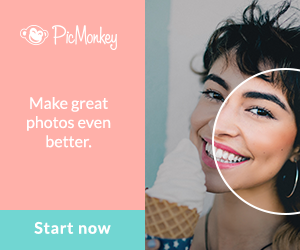 Download their freebie and take a look at what they are offering. I typed in “sewing” into the Pinterest search bar and I found an infographic on how to measure (your body) correctly, how to clone your clothes and a pattern for a stuffed animal right at the top. And once you start you will find that all kinds of ideas come to you. Enjoy! Thanks for sharing these reminders. I wonder how much I am missing out. I have a website, but to date I don’t have an email list. With the hope of getting more traffic, I signed up with Mailchimp a few weeks ago, but it is not fully activated yet. I am also in the process of finishing up a free gift. I see that you have mentioned Mailerlite. Is there a big difference between the two? I switched from MailChimp to MailerLite because I was taking a course in building an email list and it was easier to follow along. Both are free but I think MailerLite has more options for custom opt-in forms and I think the interface is easier. Plus there is free help right on the dashboard. There is no help at MailChimp except videos or tutorials on the internet. MailChimp only offers support for paid plans. I have read over and over again about how many bloggers regret not setting up email marketing earlier. It is all part of the learning curve, but it also a way to actually connect with the people who really want to know more about what you are offering. The people on your list WANT your information, as opposed to the people who click and leave your website. Irma, this thought totally resonates…”people are at various stages of research and may encounter your website at any point.” I’ve been in marketing since 1994 and have always taught others the concept of a ‘buying continuum’ when thinking about lead generation. You have zero control over what ‘stage’ your visitor is at when the hit your content, but you can make your content relevant to the people who are at the stage you want them to be at as you develop your Avatar. Some marketers love targeting people at an early stage of research while others target ‘now’ buyers. I for one love reaching peeps at all stages with both low and high ticket offers. Great post! Hello Dana and thank you for visiting us today! Yay! Thank you for saying that. I do believe that we should give away as much as we can, but there is also room to earn some money so that we can afford to keep doing that. Thanks for the advice about using email as the bridge to move from “considering solution” to “buying.” My site isn’t precisely oriented around buying products, but I do use affiliate links and product recommendations to help keep the site funded, so making that process as easy as possible for people is important. 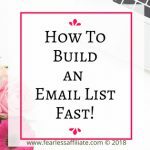 I’m still tweaking with options for building an email list, but you’ve given me some good ideas and some things to think about. I’ve wanted to put together a “free content” offering for some time but haven’t really settled on what that should look like. In any case, something that you’re making clear in this article is that we have to provide value for our audience. A lot of other things will fall into place if we maintain that focus on how we can help the people who will come to our website as opposed to what we can sell the people who come to our website. Yes, the main aspect is to provide value to our visitors. 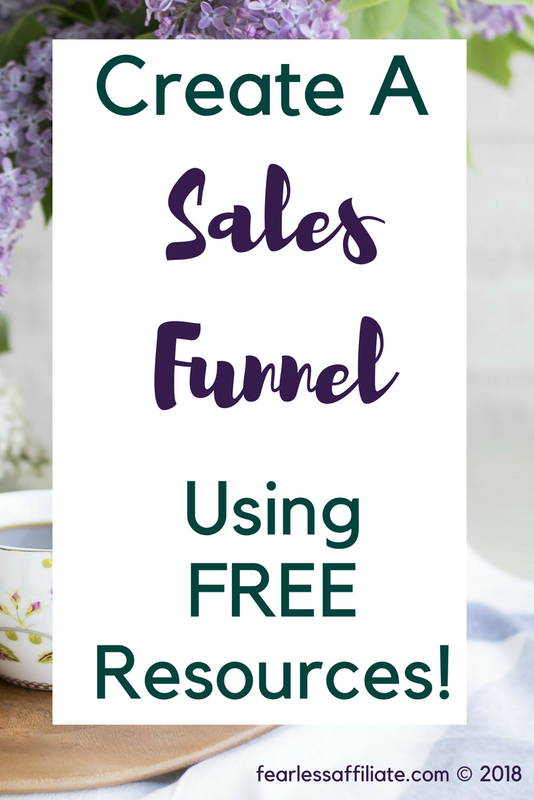 The sales funnel is just a way to earn an income so that we can continue to do that. Not everyone will buy a course or product, but a lot of people will take the free courses and get benefit from them. Hello and thanks so much for sharing, this is a good help and I must go back and read what you have written. Your readers will also love what you are sharing. Tons of awesome information that is a great help. Hi Norman and thank you for visiting today and I am glad to help! Thank you for pointing this out to me Irma. I think I am ready to take a step like this and move forward with my blog. I don’t have a lot of traffic right now, but my site is still pretty new. Do you recommend this at a certain stage or is anytime okay to get started? I need to figure out what a good freebie would be, something related to my niche website. You made me think about it and that is a good thing. I will check back with you if I have any more questions. Thanks for sharing this, it’s very timely! No, the sooner the better. There is a bit of a learning curve to setting up your email marketing so it is good to start now. You can offer a cheat sheet on different things that you can do progressively to help back pain (day one do this, day two do this) related to how you have solved your own pain in the past (because you do not want it to look like you are giving any kind of medical advice). Or list which types of problems are related to which body part ( like the symptoms of sciatic pain may be similar to another type of pain and how to tell the difference). Basic information. Or you can offer a list of things to do on a regular basis to prevent general back pain. You have lots of options. But if you had “general” back pain, before you knew what you know now, what kind of information did you look for? Probably how to relieve pain or discomfort right away. Or what you can do for yourself and when is a good time to see a doctor instead. Hi Irma, and thanks for reminding me. I’m still not ready for my mailing list but have come one step closer. I have signed up to GetResponse, not very expensive but with great value. Great to see your tips here now so I can start implementing these steps. Writing a weekly newsletter scares me a bit though, Isn’t it hard to stay fresh and have new ideas every week? I felt intimidated when I wrote my first newsletter as well, but that goes away. Remember that the people who sign up want to hear from you, so give them something that you really want them to have…tips, links to blog posts, or even point them to other bloggers that you respect that have something great to say. If you are signed up for any mailing lists that are offering special deals, like free courses or free or cheap tools. For your Thailand blog, maybe if you get emails about flight deals or hotels, or if there is a promotion coming up for a festival you can send links for great places to dine or fun places to visit. For your flip flop blog, if there are any good sales on products that you promote or new and interesting product launches. Thank you for this very helpful information. I’m one of those with a “sign up” box at the bottom right sidebar of my blog and I don’t recruit subscriptions aggressively. I need to change that, because I have high traffic and am missing opportunities. I’ll check out Mailerlite! Hello Penelope and thank you for visiting today! Until I heard someone use the words “leaving money on the table” that was my setup as well. The great part is once it is done, you only have the weekly newsletter, which does not take long to create and can link to blog posts or special deals on products that you want to share.